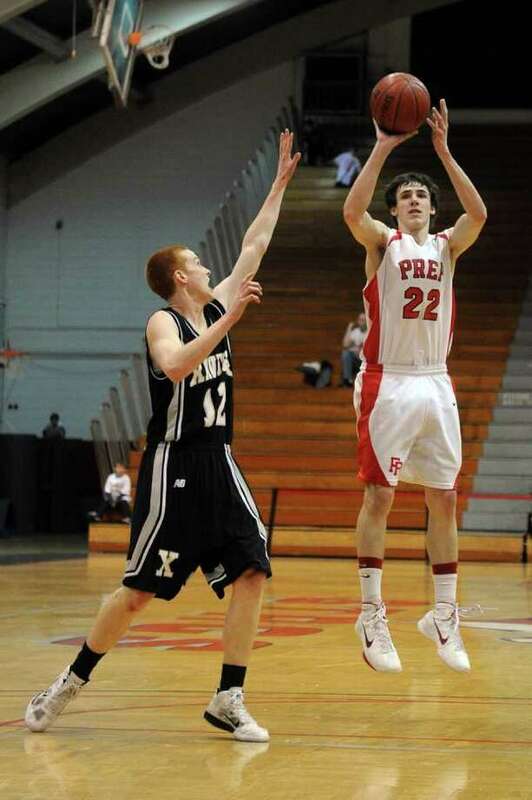 Fairfield Prep's Terry Tarpey takes a shot as Xavier's Pat Lenehan defends during Friday's Class LL boys tournament game at Fairfield University on March 11, 2011. 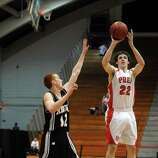 The legend of Fairfield Prep guard Terry Tarpey continues to grow. And with it, grows the Jesuits' chances of winning the Class LL state championship. Tarpey scored his team's final eight points, including a floater at the buzzer to lift No. 9 Prep over No. 17 Xavier, 61-59 on Friday night in front of 1,811 at Alumni Hall in the Class LL quarterfinals. "[Tarpey] has gotten so much better in the past month and a half," Prep head coach Leo Redgate said. "I knew it would come down to [the end]." Tarpey finished with 30 points for the game, along with 11 rebounds and five steals. Xavier was led by senior guard Mike Boornazian, who scored 27 points, 10 of which came on a 14-0 run over the course of 1:56 in the fourth quarter which turned a 10-point Jesuit advantage into a 57-53 Falcons' lead. "Our kids haven't quit all year," Xavier coach Michael Kohs said. "We'd been down in that situation five or six times this year, and every time we've been down we've come back." "[Boornazian] got very hot," Redgate said. "We expected a run." Tarpey responded with a layup. Then after two free throws by Xavier's Jovan Santos, Tarpey hit a jump shot, then a layup after Jesuits' Alex Heiman stole the ball from Boornazian and set up the junior guard for a layup to tie the game at 59. "We wanted [Heiman] to jump him," Redgate said. "He did it perfectly." On the ensuing possession for Xavier, Patrick D'Amato double-dribbled, giving Prep the ball with 40 seconds left. "We made a mistake," Kohs said. "It wasn't the first mistake we made all game." After a pair of timeouts, Prep's Robbie Bier drove to the basket, dished the ball to Heiman, who found Tarpey, who floated the ball off the backboard and in to give the Jesuits' the win at the horn. "Heiman found me in the lane and I just put it up and it bounced in," Tarpey said. Prep's Kevin Potter added 10 points, and senior forward Matt Daley scored five, despite playing in foul trouble, and fouling out with 3:21 to go in the game. Prep beat Xavier for the third time of the year, all three games were decided by a combined nine points. "They're the best coached team in the SCC," Redgate said. The Jesuits took control of the game between the end of the third and start of the fourth quarter when Prep turned a 9-0 run into an 11-point lead. However, after Boornazian was given a technical foul with 5:10 left in the game, Xavier exploded to a 20-7 run. Jovan Santos added seven of his 14 on the run. The Prep team was inspired by the raucous atmosphere and support of its fans. Tarpey also added that he and his teammates are playing for Prep senior Ryan Brennan, who died recently after a two-year bout with cancer. "We just want to win these games for [Brennan]," Tarpey said. "Everybody gave it their all."